With school on the horizon, it’s likely supply lists have been checked off, overgrown locks trimmed, and backpacks filled to the brim. However, if kids haven’t transitioned back to school-year sleep habits, they might not be ready for the first day. Trading summer’s relaxed sleep schedule for a school-year routine is an important part of back-to-school prep, says Asim Roy, M.D., medical director of the Ohio Sleep Medicine Institute in New Albany, Ohio. Kids who get their required 9-12 hours of nightly slumber are primed for school-year success. Proper rest helps children learn and retain information, because memories are incorporated during REM sleep. If a late summer bedtime lingers into the school year, kids will be subject to grouchiness, inattentiveness, or worse. Don’t expect kids to fall back into their school-year sleep habits without some help. While you can’t make them celebrate summer’s end, you can plan for brighter mornings and happier days with some advance preparation. Kids depend on a regular sleep schedule, so don’t wait until the last day of summer to dig out the alarm clock. Rising early after months of sleeping in can shock little bodies and leave kids in a daze during the critical first weeks of school. Instead, give them time to adjust to the new schedule. Roopa Thakur, M.D., pediatrician at Cleveland Clinic Children’s, recommends to begin helping kids adjust to a new schedule a week before the first day. Start by waking kids 15 minutes earlier in the morning, and moving bedtime earlier by the same amount of time. Continue adjusting both wake-up and bedtime by 15 to 20 minutes per day until both are appropriate for their school-day schedule. During the transition, adjust both bedtime and wake-up time. Hitting the sack early isn’t enough; kids won’t be tired enough to fall asleep at an earlier hour unless they’re also waking earlier in the morning. Once they’re up, let the sun shine in — fling open curtains to expose them to morning light, and serve breakfast in the brightest spot in the house. They’ll be awake in no time, and the light will reset their internal clock to help them fall asleep earlier at night, says Vaishali Flask, M.D., pediatrician at Cleveland Clinic Children’s. Though it’s vital to soak up sunlight and exercise during the day, it’s also vital to allow enough time to prepare the body for sleep, Flask says. An hour before bedtime, help kids slow down to prepare for sleep. Draw the curtains to block out late-summer rays and limit stimulating television and video games. Spend time winding down as a family with books and other quiet activities. Kids’ bodies and brains depend on consistency, so aim to keep bedtimes in check even on weekends and school breaks. Thakur recommends keeping school-vacation bedtimes no more than an hour later than normal. Sleeping in on weekends is a reality of our sleep-starved culture, but it’s no substitute for good everyday habits. A general rule of thumb: “If kids have to sleep in more than two hours later than normal on weekends, they’re probably not getting enough sleep during the week,” says Roslinde Collins-Gibbard, M.D., medical director at Rutland Regional Medical Center in Vermont. When it comes to sleep, kids are not little adults. 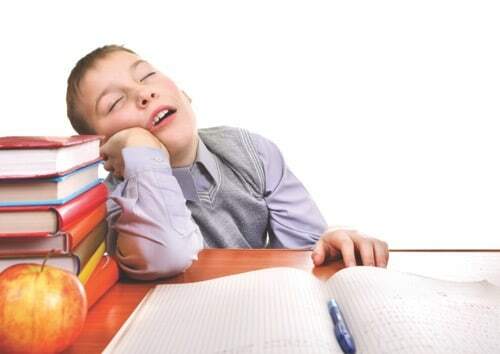 “Parents often wonder why it’s hard to get their child up and ready for school after eight hours of sleep. They’re not done sleeping yet!” Collins-Gibbard says. Good school-year snooze habits will make this year their best yet.